More and more research is available about the health benefits of a low-fat, plant-based diet making many people curious about it. However, it does seem like a daunting task to change your diet so drastically. 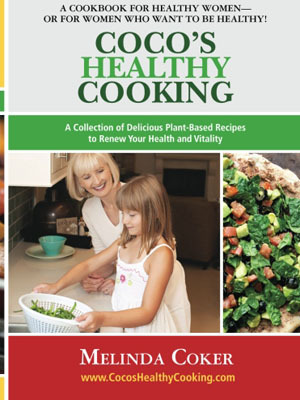 In this book, I have tried to show that you can still enjoy your meals even if you no longer eat meat and dairy by choosing recipes that taste good, yet are made from "real" foods. I love cook books that show pictures of the finished recipe, so I thought that others would enjoy having those pictures as well. I had written a previous book about the positive effects of a vegan diet for preventing/reversing cancer. Many people have told me that they agree with my conclusions, but need more help in figuring out what to eat and how to make it a pleasant transition for their families. What distinguishes your book from others? There are many vegan cook books now, but some of them use "fake" foods or lots of oils, while others are just recipes without many pictures. My book contains recipes which are vegan (or plant-based), but the recipes are made with real foods and without much oil/fat. There are pictures of all the recipes plus fun family pictures to inspire and to help me tell my story. The easiest way to change the way you eat is to use this book as your "bible" for the next few months. Plan every meal by using recipes from the book or something very similar. Pick out the recipes that you and your family will enjoy eating and that your "cook" will enjoy preparing. Make breakfast a habit. Choose one or two recipes that you can eat/drink every morning. That way you can put your breakfast together every morning without even having to think about it. Create the same "habit" with lunches. Plan 4 - 5 lunch menus and pack your lunch each morning. For dinners, put together 2 - 3 items to make a "menu." Then, list your 5 - 7 favorite "menus" and plan to rotate through them each week. The more organized you become, the easier your meal planning, grocery shopping and meal preparation will be. Use the FREE menu calendars and grocery lists to help you. Sign up now for one of my coaching programs, if you would like some personal help. 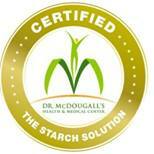 Melinda Coker is a Certified Starch Solution provider. Certification via Dr. John McDougall's extensive lectures, readings and an exam. Copyright © 2012-2016, Melinda Coker and with Splash!, LLC. All Rights Reserved. The Sassy, Slim and Healthy™ Spa Weeks, Coco's Cooking Club™, and Vegetarian Tonight: Suppers for Six™ are all trademarks of Melinda Coker & with Splash, LLC. I purchased this jumbo cookbook holder and really like it. It's well-made and sturdy and easily comes apart for compact storage.